This is an authoritative, one-volume, and independent treatment of the history, functioning and nature of the European integration. Written by a selection of leading scholars. It covers the major institutions, policies, and events in the history of integration, whilst also providing a guide to the major theoretical approaches that have been used to study it over time. 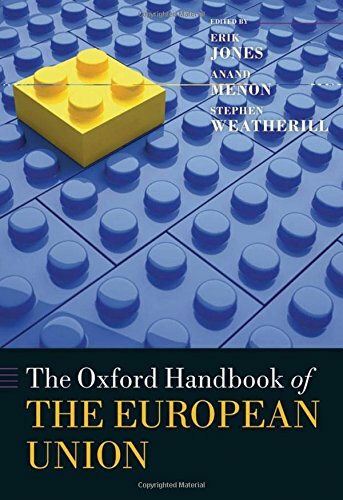 By bringing together such a distinguished cast covering such a wide array of themes, the Handbook is intended as a one stop shop for all those interested in the European Union and its predecessors. Written in an accessible style, the volume is intended to shape the discipline of EU studies, and to establish itself as the essential point of reference for all those interested in European integration, both in universities and more broadly. It represents a timely guide to an institution that is much discussed but often only imperfectly understood. Erik Jones has written on European politics, political economy, and the transatlantic relationship. His most recent book is Economic Adjustment and Political Transformation in Small States (OUP, 2008). He is Professor of European Studies at the SAIS Bologna Center of the Johns Hopkins University and Director of the Bologna Institute for Policy Research. Anand Menon has written widely on many aspects of European politics and public policy. His latest book is Europe: The State of the Union (atlantic Books). He is currently working on a project explaining the development of EU security policies. He is Professor of West European Politics at the University of Birmingham. Stephen Weatherill has written books and a large number of articles examining European Union law, ranging across the wide sweep of constitutional, instiutional and substantive law. He is Jacques Delors Professor of European law in the University of Oxford and a Fellow of Somerville College.